Ok, there’s been lots of discussion on how/what to do when relocating batteries. These are spread among a gajillion threads & w/ no pictures or diy as I’ve seen. I decided to take pics when I did it a few weeks back (everything still works, YAY!). Also, having it run inside the engine bay & a hole a I drilled w/ no grommet where it could spark and blow me up was not a fun idea – and thanks to everyone who told me it was an unsafe idea, hahaha. 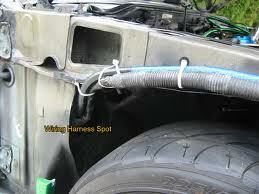 The benefit, obviously, for most people doing this mod: to run turbo piping. 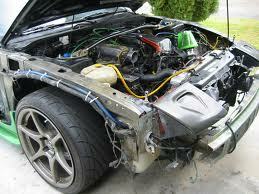 Also, better weight distribution, cleaner engine bay, etc. – Relocation Tray – please use the correct kind. I bought 4 m10 bolts w/ 4 m10 nuts, 1 m8 bolt & nut to hold mine down to the chassis. – Wiring & Circuit Breakers – I’d like to thank John Gonzalez from Fusion Electronics for the wiring I requested even though he’d probably never find this forum – inadvertently partially sponsoring my turbo project. 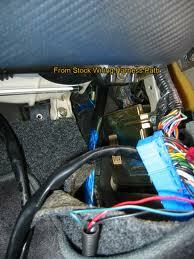 I had a 0 gauge amp wiring kit – very flexible good stuff – about 10-15 feet – better to buy extra that you can cut. 140amp or 200amp circuit breakers depending on your toys. And several 0 gauge connectors. Also some wiring protection sheathing, electrical tape, zip ties, etc. 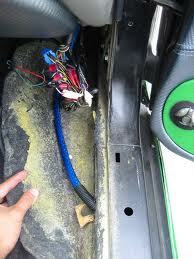 Take out the passenger side interior trim (makes it much easier, trust me). Or driver’s side if you wish to do it this way – I will be referring to passenger side entire install because that’s the way I chose to do it. 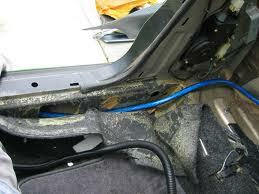 Remove rear seats & trunk trim. This is ONE way to do this, many other ways/configs. I hooked up the alternator & battery line on one side of the circuit breaker, and the accessories on the other side – this will allow me to isolate the electronics from the power sources. This part was done as part of the “rerun the stock harness above the chassis line w/ zip ties” thing you do to lower your car more and not eat through your harness. Makes for a super clean install – I don’t know how this affects stock fenders, but my wide fenders fit it just dandy! May take you some pesuasion on stock fenders. I cut up the stock harness grommet a bit w/ a tiny drill & screwdriver – it’s tight so it will still keep most air out, hehe. 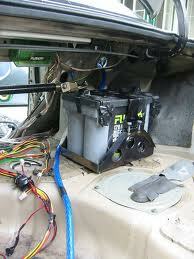 Some ppl have qualms with this (me being one of them) that it will affect the ECU by introducing noise. I have been running this for a month or so now w/ no problems. Also, I stuck it a little further away from the ECU just in case. There is a stock hole you can slip the wire into here. 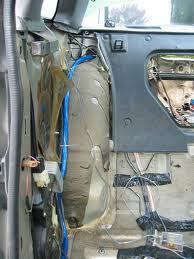 I used the protective sheathing to keep the wire from rubbing against the chassis and shorting out. Yup, more stock hole goodness. You can use the stock holes yet again – hope you took out the trim like I said! Here is where more possibilities exist. Mine is done ONE way of a gajillion. I basically run the wire to a circuit breaker. The other side connects to the battery. The ground I used connects to a wire wheeled/sanded down part where the spare tire goes. I have lots of other stuff going on, so a spare tire isn’t really usable anymore (plus I’m 5-lug & Z brakes). The relocation tray itself is held down by 4 m10 bolts, 3 of which have nuts on them w/ blue thread sealer, 1 doesn’t because of the place I drilled it, but helps keep everything stable. Because I’m paranoid, I also drilled a 2nd m8 bolt on the side of the tray through the fender area. The tray is directly behind the strut tower, and there is plenty of room to drill, just be careful about the fuel pump hoses, gas tank is a good few inches away. The minimal requirement from the NHRA is 3 m8 bolts, just for reference. If you did it my way, it is now VERY easy to shut off power to your car to work on simple things – just power off the Circuit Breaker in the trunk. I plan on relocating the Engine Bay part higher up closer toward the coolant area for a cleaner, “safer” install, & allow me to run intercooler pipes easier. Also, possibly adding a circuit breaker to the Negative side should help if a short (*knock on wood) happens. I’m not sure how much this will help, and I hope I never have to find out. Hope that helps some ppl out there. Good LUCK!